I'm not telling anything new when saying that this present time is challenging. The Chinese character for challenge consists of two characters, 'danger' and 'crucial moment'. When in danger we find ourselves in a state of heightened awareness. The inner dialogue comes to a halt, clarity descends. In the absence of thinking our energies become coherent. A focused laser beam can cut through any obstruction and adapt to entirely new circumstances. Challenging situations are propelling evolution. They are testing our determination and courage, our ability to remain centered and in good spirits. Scorpio indeed is a special sign. Its keywords are change, transformation, transfiguration, death and rebirth , resurrection, total make-over, tear down and rebuild. In the Tarot, Scorpio is represented by the 'Death' card, death being the quintessential counterpart of 'Life'. Every new moment arises from what has been, every breath we take is unique and new, without precedent, nudging creation one notch higher, breaking new ground, setting novel fragrances free. Back in the 1970's, Jane Roberts channeled the disembodied entity Seth. I was in my early twenties and I was fascinated by Seth's revelations and teachings. From what I know, Jane Robert's books are some of the finest of channeled materials. In accord with latest findings in physics, Seth explains that 'reality' by far is not as real as we perceive it to be. This 3D universe is one particular wavelength. All we see, uncountable stars and galaxies included, is but one station on the cosmic radio dial. As is the nature of waves, there's nothing static about them, everything is in oscillation. Frames are changing extremely fast, so much so that our experience makes us believe that things are solid and permanent. We're totally unaware of the gaps between the pulses. It's similar to watching a movie. Our eyes see the smooth flow of sceneries while we know that it's 24 frames per second. This demonstrates how perception can be misleading. Billions of times per second, reality comes in and goes out of existence. Half the time the slate is clean, everything turned off, formless. And guess what, these gaps are far more real than the changeable universe. Forms come and go, the quantum vacuum, the cosmic womb prevails. Enlightenment may be explained in many ways. To be aware of and attuned to the interstices, the puncture holes where the eternal shines through, is one way it expresses itself. Many spiritual teachings, rituals and meditations are designed to help us become aware of these gaps. The sign of Scorpio is complex. It encompasses a vast spectrum, ranging from hellfire to ultimate liberation. Scorpio therefore is home to a variety of animal totems - Snake, Eagle and Phoenix. Scorpio is the 8th sign of the zodiac. The eighth note of a musical scale is the octave, the coming back home on a higher level, a natural completion and conclusion. On its lower level, Scorpio frightens us. The Hindu goddess Kali represents this dark realm; destroying for the sake of clearing ground, making space for new beginnings. Death and transformation come in one package, they're two sides of the same coin, they happen simultaneously. Our problem is that from our vantage point we only see the dark side. Being onlookers we only can see half the story. The other side of the coin won't show itself before our time has come. However there are cracks in the egg, freak events, indicating that there are many more levels to existence than we're able to perceive. There are many individuals who have come back from the very fringes of life. Accounts of near-death experiences sound surprisingly alike, regardless of circumstances and cultural background. Prove of Heaven, is a personal story by neurosurgeon Dr. Eben Alexander, a wonderful and deeply inspiring read. We're entering a most critical period. On November 8, TEPCO (Tokyo Electric Power) wants to start removing the first spent fuel rods from the pool on top of compromised Fukushima unit #4. Nuclear experts are concerned that this is a dangerous undertaking. In this video link Dr. David Suzuki shares his view. The other big news event: after many months of smoldering, the scandal kindled by the ruthless spying of the National Security Agency NSA is starting to heat up, getting closer to center stage. Initial revelations sent shockwaves through the world. We might still be in awe, rubbing our eyes, not yet fully able to grasp the magnitude of what's going on. Just lately, parliaments of many countries, including America's, are starting to investigate into this worldwide breech of privacy laws. We are social beings, constantly exchanging energies with our environment. Whether we're aware of it or not, we nurture what we choose to give our attention to, regardless of whether we approve or disapprove. A good way to realize this is when you sit in a restaurant looking at someone. You can be certain that this person will feel the unconscious urge to look in your direction. When giving attention to someone or something we're extending ourselves, literally adopting the subject into our energy field. We can make practical use of this law. Intuitively we all do so while driving, wandering with our eyes ahead, connecting with whoever might be out there, announcing that we're coming, alerting wildlife to stay out of our way. This Earth is one big boat. We know there are no lifeboats, unless we're planning to go to Mars. I rather would like to stay on planet Earth and I'd like to feel its pulse, I'm concerned of what goes on in our world. History has shown this many times: when motivated and emotionally involved individuals come together, movements can gain momentum in no time. Just think of the fall of the Berlin Wall in 1989. The realization that we cannot exclude ourselves, that we're part and parcel of this reality is the first important step. Digging a bit deeper we might recognize that also we're part of the problem, hence we may want to be part in the solution. 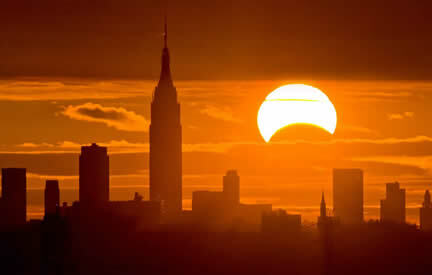 With the November 3, Hybrid Solar eclipse we enter a time of sobering up. We might have to face some critical development, warranting a move towards temperance. It takes guts to cut through illusions, taking honest inventory of our world. What keeps us on track however is the intuitive knowing that empowerment and healing are on their way. With Venus entering Capricorn on Tuesday, November 5, social responsibility will emerge. Life's voices are getting louder, urging to look around, accepting that we're part in and part of what is. We're all equally responsible for the mess this world is in. For four months, until March 5, 2014, Venus is in the cardinal earth sign Capricorn; while comet ISON most likely will dominate the night sky, treating us with a great show, heralding the arrival of a new epoch. Venus in Capricorn is highly auspicious. The overall cosmic combo might initiate changes in society at large, generating cascading flows of social activity and activism. We might see movements of concerned individuals, promoting smart solutions of how to tackle world's pressing issues. A new tone of unbiased assessment will set in. No finger pointing, but sincere and passionate commitment, generating a mission destined to succeed. Take it easy this Monday morning. Until 1 p.m. MST the Moon is void-of-course in Scorpio. Listen to your intuition, don't allow your logic to question your impulses. We have been brought up mistrusting our gut feelings. Pass review and you will remember incidents of that sort. There's some urgency in the air. Nevertheless, be methodical, take one step at a time. Enjoy the ride, it may be very exciting! 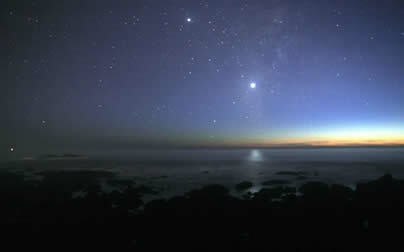 For the weeks to come Venus is shining brightly, dominating the evening sky. Today Venus initiates its 4-month stay in Capricorn. From 9 a.m. MST on, the Moon is again void, this time for an unusually long period, until Wednesday afternoon. Use this day to contemplate, have a deep look within yourself. This is not the time to initiate any new moves. One day ahead of the Sun's alignment with Saturn we feel a compression, a crystallization is under way. The White Rhythmic World Bridger is a gentle, deep and focused energy. A great day to forgive, foremost yourself. Take an inventory of your emotions, it's possible to perceive them way clearer than usually. At 2:44 p.m. MST the Moon crosses over into Capricorn, the time for decisive action has come. Bold moves are rooted in love and appreciation. We may lay foundations enabling to move ahead in groundbreaking new directions. Later today, Jupiter culminates on its yearly flight, retreating 'til early March 2014. Quite a wired and intense day, full of all kinds of necessary adjustments and adaptations. Elegance and perfection are traits of the Yellow Galactic Star. Be careful not to get too demanding, shooting past your target. Practice modesty and gentleness, they're today's most important virtues. The Capricorn Moon is void 'til 4:30 p.m. MST, making for an emotional, rather imaginative and unpredictable day. Attune to the free floating mood. There's lots of empathy in the air, allowing to connect on deep levels with people who live far away. An emerging Aquarius Moon concludes this Friday evening, offering itself for a great party night. Interesting and inspiring conversations with illustrious friends may leave lasting impressions. Today we might need to support others, offer our assistance or fulfill commitments. Anything we would do for our friends, and chances are that we will make new friends today. The Aquarius Moon is altruistic and enjoys building community. The Moon is void 'til after 7:30 p.m. MST when it enters Pisces. You may channel an abundance of creative and playful energies, expressing your emotions, giving them a voice, a shape or color. The Blue Spectral Monkey introduces quite a wild and sensual drama, bordering illusion and deception.